First up, it's the eyeliners. It turns out that these might actually be fun because of the colors included. Bare Minerals Big & Bright Eyeliner - Midnight-Visually enhances the whites of eyes, so eyes look whiter and brighter. Infused with a blend of 100% pure bareMinerals, conditioning botanical extracts and antioxidants. Soft smudge tip and sharpener. This is a navy blue which is fine with me. I like blues. I'm not sure about the whole "brightens your whites" thing. That sounds like laundry detergent. I'm keeping it, though. 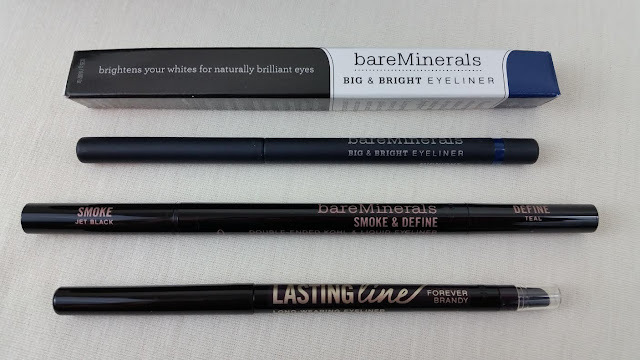 bareMinerals Smoke & Define Double-Ended Eyeliner- This was part of a QVC trio. 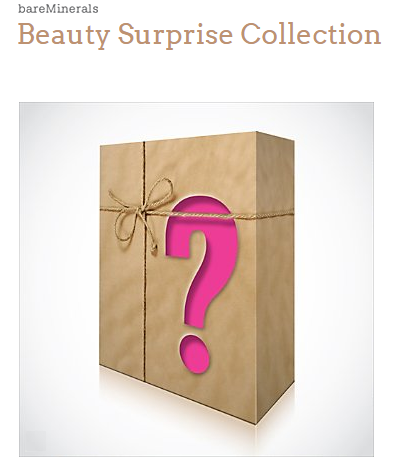 It looks like they broke them up to put in the Beauty Surprises. Although my invoice did say specifically that I was getting teal. And I did. It's got teal liner on one side and black on the other. The teal end is liquid! Lasting Line Long-Wearing Eyeliner in Forever Brandy-Delivers long-wearing, richly pigmented color infused with a nourishing blend of minerals and vitamin C for soothing. This is a pretty burgundy. I think I might end up using this, too. I like browns and purples so... It's a twist up pencil but it has a sharpener and a smudger, too. Lippies! I love getting anything to do with lips. These are both minis which I don't mind at all because they're much easier to hide on your person or put in a pocket if you don't want to lug around a handbag. 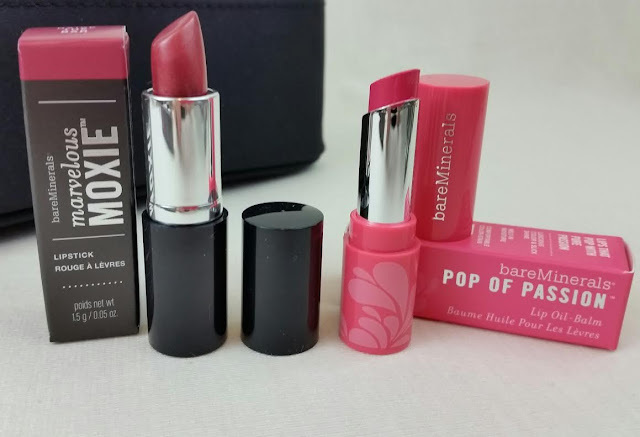 Marvelous Moxie Lipstick in Raise the Bar (mini)-Creamy, super-saturated, ultra-pigmented color glides on like butter for full coverage in a rich satin finish. Classified as a pearlescent raspberry, I'm happy because this color looks great on me! Pop of Passion Lip Oil-Balm in Pink Passion (deluxe sample)- Youthful pink. This decadent lip oil-balm hydrates, nourishes and delivers luscious color that looks as good as it feels. I don't like this because it smells funny. Like bad oil? Hm. Bare Minerals Ready Illuminating Touch Up Veil in Translucent- This is a half size. This formula diffuses the look of imperfections and reduces shine for an airbrushed finish. Translucent is for all skin types. I think I might already have this somewhere. If I do, it means I'm not using it in the first place. Maybe I should be! I don't like shine. 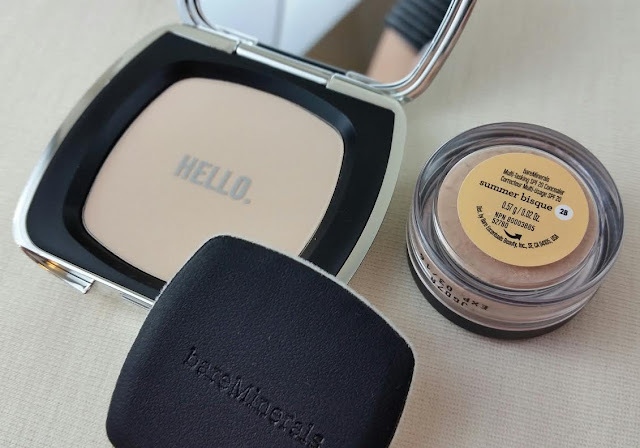 Bare Minerals Multi-Tasking SPF 20 Concealer/Corrector in Summer Bisque- Besides working as a beautiful, soft shadow base, Bisque also performs as a miracle concealer for your face and with SPF 20, protects your skin from the sun. Cover all imperfections, including dark circles, brown and red spots, blemishes, broken capillaries, scars and other skin imperfections. Summer Bisque is for light to medium complexions with golden tones. I'm light but I'm pinky. Plus I dug around and I have the regular Bisque which is the correct color for my skintone. I don't think it works as well as a more traditional concealer but I like it. This is a half size. 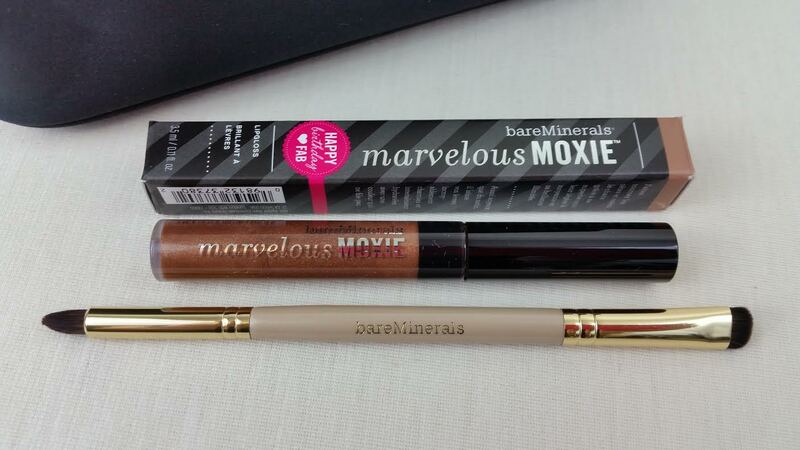 Marvelous Moxie Lipgloss in Risk Taker- Chocolate shimmer. Luscious, vibrant color loaded into a refreshing formula that slips on satiny-smooth for sheer-to-medium coverage with nonstop glistening shine. This is not my color so it will find a better home. I like pinks and mauves. Bare Escenturals Rock N Roll Eyeshadow Brush- This apparently is/was part of a kit from what I can tell. I'll use it. I need all the eyeshadow help I can get. I just got three new palettes to play with. It also came with a cosmetics case. 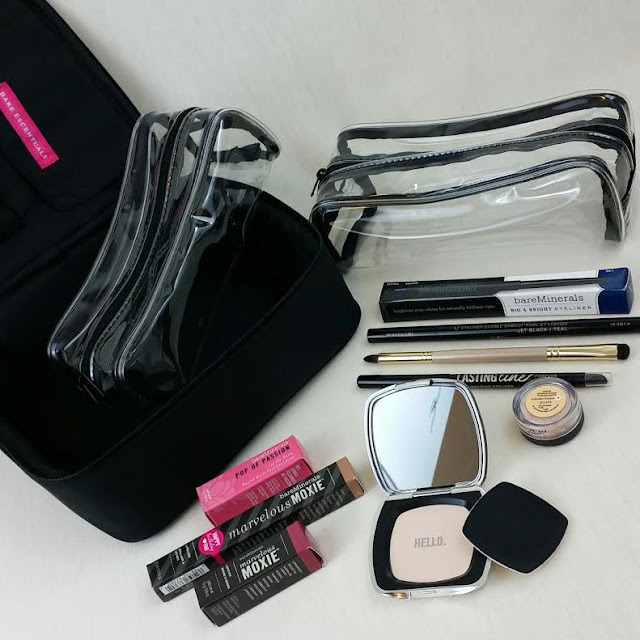 It's a sturdy square that has room for your brushes in the lid and then two plastic zip cases to hold your makeup. 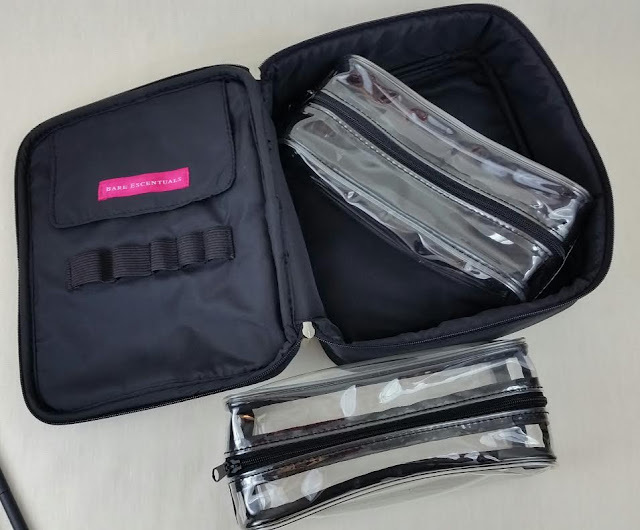 Both plastic pouches fit into the black zip case but you could use them separately. I'm definitely going to be using this because I need some makeup storage help, for sure! Hah. VERDICT: I'm sure I'll succumb to curiosity again after enough time passes and I'll purchase another surprise. It's technically worth it but I think I don't use enough makeup to really make it a good value for me. Although I do like one of the lipsticks and I will probably end up experimenting with the new liner colors, I have enough BareMinerals to last me quite awhile. These are sold out right now but they come along about twice a year? Maybe more and I'm just not aware. I don't know. I can't really say they're the best thing ever because the contents can be so random! I'm kinda neutral on the BareMinerals brand & have never mustered enough courage to spend that much on this box but if I would've know I would've gotten this, I would've gotten it this time around.